Bell’s comedy focuses on race and particularly on the national conversation about race, something that it can be hard to get people laughing about. As you can see, Bell’s is smart, incisive comedy. As you can imagine, it was an absolute pleasure to sit down with Bell and talk about The Matrix, the future of feminism, and just how cool his mom is. And now, without further ado, the Feministing Five, with W. Kamau Bell. Chloe Angyal: What got you into comedy, and specifically into the kind of comedy that you do? W. Kamau Bell: That’s kind of two different stories. Comedy was something I wanted to do since I was a little kid watching TV, watching Eddie Murphy on Saturday Night Live and thinking “that looks cool.” Bill Cosby was a big influence. His big stand up thing was called “Bill Cosby Himself” and it was the thing that landed him The Cosby Show, and I remember seeing that and thinking it was like magic. I was an only child, so I was left alone with my own brain a lot, and I thought I was fascinating. It was just me and my mom and she told me I was hilarious. As a kid comedy was always something I wanted to do, but I didn’t know how to do it. How do you start that? I was never the class clown – me and my best friends were all clowns. So I didn’t think of myself as the funny one, because we were all funny. When I was twenty-one, my best friend Jason knew that I wanted to go into comedy because I talked about it enough, and he found an open mic night near his house. So we went and we watched, and I got the courage to go up. Without Jason I never would have done it, because he went with me the first two years, every show I performed at. I wouldn’t have done it without him because I just didn’t have that kind of intestinal fortitude. WKB Curve in NYC on 10/21/10! Hey NYC people! I'll see you next week Thursday, October 21st @8pm for another edition of my show, The W. Kamau Bell Curve: Ending Racism in About an Hour. And this time it is a New York's premiere comedy spot The Upright Citizen's Brigade Theater --- or UCB, if you're nasty... and if you don't already associate UCB with The University of California at Berkeley. The best part is that it is only a recession busting FIVE BUCKS!!! WOOOHOOOO! What a bargain! Click here for details. Racism will be ended for less than the cost of a vente mocha with an extra shot of espresso! I hope to see you there. And if not I hope you let your NYC people know. Thanks! I'll be in NYC for s couple of weeks and I'm booking other shows, stand-up and otherwise, so there will be many other opportunities to see me there. if you know of any, forward them along. Thanks again. The W. Kamau Bell Curve RETURNS to NYC for ONE NIGHT! Looks like I'll be heading out to NYC to do my show at UCB on Thursday, October 21 @8pm. ONLY FIVE BUCKS!!! Click here for tickets! The W. Kamau Bell Curve is a comedic exploration of the current state of America’s racism, combined with a little (unknown) history, a little Powerpoint, and a whole bunch of Kamau. Prepare to have your brain squirt out of your head. Prepare to have your brain squirt out of your head. This is an ad that will appear on buses in NYC. So yeah... YUCK! YUCK! YUCK! YUCK! And this is an interview with a spokesperson for American Freedom Defense Initiative, the organization that paid for it. In conclusion, the lesson here is just because you don't like something doesn't mean it's wrong. Putting together race and comedy can and sometimes is a recipe for disaster (side note: I think Hitler needs to be retired as comedy fodder, having heard a few too many of them last night), but in The W. Kamau Bell Curve: Ending Racism in About an Hour, on now at PS 122 as part of the SoloNOVA Festival, W. Kamau Bell not only makes his points funny but uses media clips, storytelling and crowd work to get people thinking about race, and laughing. I saw it on Sunday at 6, during a gorgeous day, so the theater wasn’t full. I walked in and showing on the screen were Bell’s thoughts on some modern films, like why Jake Gyllenhaal was cast in Prince of Persia. Bell then comes out and shares some thoughts on race and racism, and the difference between the two. Bell is noted for telling the first joke about Barack Obama back in 2005, a clip he shows. At one point, after seeing some horrific clips where John Stossel and others basically defended the government staying out of racism in the workplace, those of us who are white were led to chant, “Say it loud, I’m white and I’m proud.” Yes, it was funny, but it was also a very surreal and disturbing feeling (speaking for myself) to say that, let alone think it, but I believe Bell’s point was that being proud of who you are doesn’t only belong to the crazy white people, and that white people who don't want to be associated with racist white people need to also recognize that being white in and of itself isn't something to be ashamed of. That was my takeaway, anyway. Bell also took us through the 2010 census, which by now we’ve probably all seen (even, um, those of us who got a notice on our door because we sent ours in way late), but he also talked us through the very earliest version of the census which made this country’s priorities at the time quite clear. He talked only briefly about his own life, showing a photo of his parents, one of the few he has, and sharing a story of realizing he was black, and thus different from his white schoolmates, at the age of six. I wish there had been a little more personal detail because Bell is a compelling performer and one who, by his own admission, thinks about race and racism all the time. I’d have loved to hear a little bit more about how those thoughts evolved into the show (which has been running in various venues and evolving for the last few years), but I do realize he only has “about an hour.” He also talked about interracial marriage, the issue and, briefly, his own and the Loving vs. Virginia Supreme Court decision and shared this quote from Mildred Loving, which I hadn't seen before (taken from About.com) and tied it in to Prop 8 - a minor mention but one of many seemingly disparate issues that Bell weaves into the show in a seamless way, so you don't quite realize how much information and how many ideas he packs into the small amount of time. I am still not a political person, but I am proud that Richard's and my name is on a court case that can help reinforce the love, the commitment, the fairness, and the family that so many people, black or white, young or old, gay or straight seek in life. I support the freedom to marry for all. That's what Loving, and loving, are all about. Perhaps the most powerful moments, for me, were when he shared YouTube comments he received on some of his videos. On one level it’s easy to dismiss them, and I would think someone who’s so out there would be immune to that, but he revealed that they gave him pause (I’m not going to repeat them because I didn’t have my notebook out and the visual element is really what made it strong). I liked the show because while yes it was a one-man show, Bell encouraged some degree of audience participation and truly seemed invested not in having us all think exactly the same way he does about these topics he brings up but in simply thinking about them rather than brushing them aside or pretending that we are, in a phrase he wisely mocks, “post-racial.” He showed a hilarious clip of some news commentator saying that when he looks at President Obama (and I’m paraphrasing) that he forgets that he’s black. “You know who doesn’t forget that Obama is black? Black people!” roars Bell. To bring this back to, you know, me (jk, kindof), the other day I was having cupcakes with my friend Twanna (aka Funky Brown Chick) and she mentioned something about the blog Angry Asian Man and I said I knew it and then I was like, “Wait, I mean…” and she was like, “Disgracian?” and I said yes and maybe you had to be there but it was this "all Asian blogs look alike" moment that I was thinking about during the show because we can and do laugh about it. There was this other part of the show where Bell reveals two things never to ask a black person (you should see the show for that) but it also reminded me of when I felt like a complete idiot and both Googled and asked Twanna if black people should wear sunscreen, because I honestly wasn’t sure and felt very, for lack of a better word, white, and thus ignorant, about it. And she very kindly assured me I wasn’t an idiot. Both of those examples were moments where we could talk, but also laugh, about race, and I think sometimes that’s something that only happens amongst close friends and, well, I’m sure plenty of people don’t have a chance to actually engage or think or, most importantly, laugh about race and Bell gives people a space to do that while also talking about historical racism and present-day racism and, best of all, laughing, while we do so. I'm clearly not a theater reviewer or comedy blogger (anymore) and don't aspire to be, so this review is perhaps a little disjointed but I encourage those in NYC to check out the show tonight, tomorrow or Friday. And I went solo, but there really is a deal that if you bring a person of another race, tickets are 2 for the price of 1! Use the promo code "solo241" when buying tickets here. Here's a clip from a previous incarnation of the show (from what I know, it's constantly being updated, so Arizona gets some play in this version). See more videos here. Gearing up for another broadcast of Radio Free Brooklyn tomorrow night! In addition to having some tasty music treats from the new black imagination, I'll also have a live, in-studio interview with SF-based comedian W. Kamau Bell. Kamau is currently in town doing a standup show called The Bell Curve: Ending Racism In About An Hour. Cool thing is, the show's been extended into early June. So, tune in tomorrow night from 9-10, and then check out Kamau's show or his comedy album, Face Full of Flour, now available on itunes and Amazon. Citizen Radio LIVE in NYC w/ ME! TONITE May 24th 8pm $5! The acclaimed grassroots political comedy show Citizen Radio brings it's filthy outrage to the UCB Theater. Ending Racism in an Hour? Yeah, That's Funny. To promote his one-man comedy show The W. Kamau Bell Curve: Ending Racism in About an Hour, now running as part of the seventh annual soloNOVA Arts Festival at PS 122, stand-up comedian W. Kamau Bell is making a special offer: "Bring a friend of a different race and get in 2 for 1." Bell hopes that this bring-a-friend-for-free discount will help fill the theater with New York audiences who might not have heard of the San Francisco Bay Area comedian yet. "Although, I have selfish reasons for that, too," Bell says. "It guarantees me a better crowd. You can't end racism unless everyone is in the room at the same time." Yet to end racism, you have to discuss racism. And to discuss racism, you have to talk about race. And once the conversation turns to race, a lot of (white) people automatically worry about sounding racist. Or, as George Costanza would say, "I really don't think we should be talking about this." Bell uses comedy, therefore, to broach a subject most people are simply too afraid to talk about. You might be thinking, The election of Barack Obama, our first black president, ushered in the era of "post-racial" America, right? Wrong. Bell utilizes a sharp mix of stand-up comedy, Powerpoint, audio and video clips, and theatrical solo theater to illustrate the ways racism just keeps making a comeback. "This show isn't about post-racial America," Bell says. "It's about racial America." Even so, the idea of "ending racism in an hour" probably sounds like a joke. That's because it is. Well, sort of. "Obviously, my claim of ending racism in about an hour is tongue in cheek," Bell admits, "but what I am serious about is using humor to attempt to advance the discussion of racism in this country. I may not always be successful in this, but I am trying. One of my biggest rewards is that people often tell me that they think about my show for a long time afterward, and that it leads to discussions with other people. I believe those talks are how you actually begin to end racism. Even if people disagree with parts of the show, I hope we can at least have civil discussions about it -- discussions that elevate us above many of the comments on my YouTube page." "Over the years, the material of the show has been turned over three or four times," Bell says. "The show has moved past the celebrity racism and now has a very political attack. When I wrote the show initially, Barack Obama was a just a senator who some thought could make a good vice president for Hillary -- if he was lucky. So obviously, the discussion of race and racism has changed significantly since 2007. The show reflects that, and tries to stay ahead of it. "The show is built on ideas," Bell adds. "Some of those ideas are built on jokes. Jokes are often good truth delivery systems. Check out Malcolm X. He's my hero. He managed to be extremely truthful and hilarious at the same time. I don't feel that comedy has any responsibility to teach or enlighten. The only responsibility comedians have is to be funny, regularly. I choose to use my sense of humor to talk about race." Bell has performed The W. Kamau Bell Curve: Ending Racism in About an Hour for the past three years, including sold-out shows in San Francisco, Oakland, and Berkeley. soloNOVA producers saw The W. Kamau Bell Curve last year at the New York International Fringe Festival, and encouraged Bell to apply for the soloNOVA Arts Festival. "We scouted a lot more heavily this year," says soloNOVA artistic director Jennifer Conley Darling. "We saw every solo show in the Fringe Festival, as well as the Frigid Festival... Partnering with other festivals has been key to identifying the best of the best. I knew immediately I wanted Kamau in the festival. His intelligence, humor, and timing far surpass a lot of comics out there. I see racism every day, all over the world, and to be able to talk about it with a humorous lens is key to continuing the fight against it." soloNOVA, produced by terraNOVA Collective, "celebrates innovative individuals who push the boundaries of what it means to be an artist, aims to redefine the solo form, and uniquely invigorates the audience through the time-honored tradition of storytelling." 'The W. Kamau Bell Curve: Ending Racism in About an Hour' performs May 14, 16 & 20 at 9 p.m. and May 22 at 4 p.m. at Performance Space 122, 150 First Ave. (at 9th St.), as part of the seventh annual soloNOVA Arts Festival, which runs through May 22. For more info about soloNOVA and to purchase tickets, visit the soloNOVA website. Bell will also perform as part of the comedy night lineup at soloNOVA's "Ones at Eleven" series on Saturday, May 15 at 11 p.m.
Read about the previous soloNOVA opening night performances of Binding, Remission and Monster, and Rootless: La No-Nostaliga at Blog Stage. Back Stage is a sponsor of the soloNOVA Arts Festival. & Now for something completely different A WKB CONTEST!!! So I'm trying something new at WKB Industries. I'm working hard to get people to come out to my NYC shows, so instead of just asking (ummm... begging) for your help. I thought I'd make it a little more fun for you! A CONTEST!!! If you tweet about my upcoming shows in NYC, you can win a copy of my new cd, Face Full of Flour, autographed by yours truly with some other swag thrown in for fun (stickers and maybe even an inappropriate picture or two). All you have to do is talk about my shows on Twitter (using the hashtag #TheCurve) and a link to my Facebook invite (http://ow.ly/1KjHJ). I’ll choose a winner at random on May 24, once the shows are over! You MUST include the #WKBCurve hashtag and the link http://ow.ly/1KjHJ for your entry to count. Only one tweet per day will count. We don’t want to spam all of your followers. If you have any questions, feel free to email me or my other people: info at whitesmithent dot com. Thank you for all of the support! BRING A FRIEND OF A DIFFERENT RACE & GET IN 2FOR1!!!! One part manifesto, one part diatribe, and several parts funny. “W. Kamau Bell is in the vanguard of a new era of American comedy for an unsettling, troubling, and strangely hopeful time. Firmly in the fearless tradition of Mort Sahl, Lenny Bruce, Richard Pryor, & Chris Rock. Comedy as common sense purged of the absurd hypocrisy that is Our America.” — Vernon Reid of The Grammy Award winning band, Living Colour. BRING A FRIEND OF A DIFFERENT RACE & GET IN 2FOR1!!! JUST LIKE SKINNY JEANS, superhero movies, and frozen yogurt, racism continues to make a comeback. 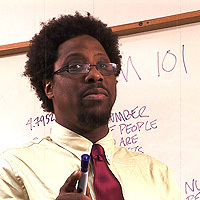 In 2007, The W. Kamau Bell Curve: Ending Racism in About An Hour opened big and came out swinging against big targets. Back in 2007, it was celebrity racism that was all the rage. (Imus, Kramer, Rosie O’Donnell, Dog The Bounty Hunter, etc…) But three short years later, amazingly, America has elected the first black president… of the Republican National Committee!!! Oh, and we also elected the first black president of the United States of America, Barack Hussein Obama. All this MUST mean racism is over. Right? We’re officially in Post-Racial America… Right?… Right? WRONG! Racism has redoubled — no, re-quadrupled — its efforts. Because now that a black man — or a half black/half white man if we want to split not so nappy hairs — is leading the free world, the stakes just have gotten much, much higher, especially for the really racist racists. And racism hasn’t run this rampant since Martin Luther King, Jr. had that dream. While the economy fails, racism is thriving. Whether it’s Rush Limbaugh’s & Glenn Beck’s daily treason, OR tea parties that look like casual Fridays at Ku Klux Klan rallies, OR Henry Louis Gates getting arrested for having a sticky door, OR the state of Texas deciding that the only good history book is a WHITES ONLY history book, OR the continued broadcast of BET, OR Tyler Perry… being Tyler Perry, OR the one-two-three cinematic punch of The Blindside, Avatar, and Precious. Meanwhile the 2010 Census STILL wants to know how many “negroes” are out there. And all the while black people wonder, “Did we get a black president OR a president who is black?” Well, W. Kamau Bell is here to make (non)sense of all of it all. The Curve is a comedic exploration of the current state of America’s racism, combined with a little (unknown) history, a little Powerpoint, and a whole bunch of Kamau. And because racism is always attacking in new ways and from new angles, Kamau attacks back by constantly adding new material. The Curve is a seamless mix of stand-up comedy, video and audio clips, personal stories and solo theatrical performance.